nice click priya.. very healthy sambar with veggies added..
Love this classic sambar! Looks delicious! 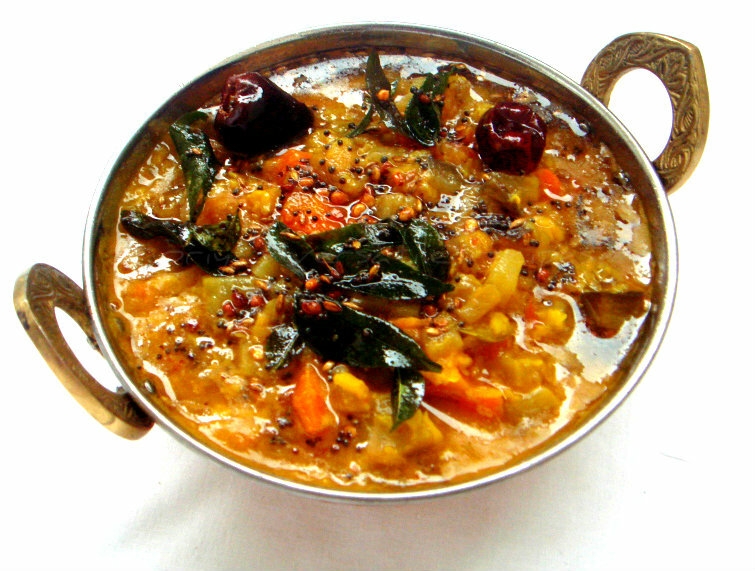 Delicious sambhar, I make mixed vegetable sambhar than single veggies. Thanks Priya for posting such quick,delicious and easy sambhar recipe...loved this! This is super-quick. Will bookmark and try it out. Love this quick sambar..Sure will help in busy days.. Most often I make such sambar Priya..Truly tempting and quick fix. Lemon juice in a sambar - that is new to me... i have done lemon rasam but not lemon sambar!!! Hi Priya, belated Happy Diwali:)..sambhar looks great and recipe is really good!! must try!! Pressure cooker sambar is so easy to make, yet it doesn't compromise much on the taste. Great pic! I too make a sambar like this on busy days.The only change is I add a pinch of hing while pressure cooking the dhal. My husband makes this kind of sambar, truly a bachelor sambar, no grating, grinding involved :-). I love the mixed dals in there.